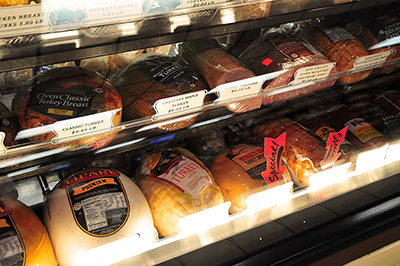 Our deli departments are full service, so you can get your favorite cheese and meats sliced fresh to your liking. Additionally, each location has fresh deli made salads and sandwiches, as well as hot foods like rotisserie chicken, pot pies, hot soups to go and more. Planning a party? We’ve got you covered! We offer a variety of attractive meat, fruit, and sandwich party trays in all different sizes. Please give the deli 24 hours of advance notice on tray orders.